Ruby is the astrological, Jyotish gem related to the Sun, which rules one's person confidence, authority, power and status. The Sun is related to the soul and has a great deal to do with career and the person's worldly activities. Success in maintaining a healthy body, vitality, immune system and the willpower of achieve greatness in society is under the purview of the Sun. Wearing a ruby of at least 1 carat is said to increase popularity and professional status. It will cure diseases of the eyes and of the heart. 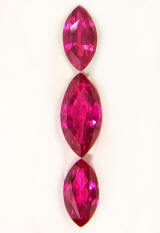 Ruby can be substituted with pink sapphire (in women), red garnet and red spinel. If you want to know more about astrological and healing benefits of the ruby, click here. Important: Important: The following pictures are highly magnified (30X) and do not show the gems' real size. Color and brilliance can greatly vary from computer to computer, depending on your monitor's settings. Color will also, naturally, vary from sunlight to indoor, incandescent light. Dark and lighter areas are effects from the digital camera. See description for accuracy on clarity grade, color and exact dimensions in mm. All the Burmese rubies listed here were cut and polish, purchased in Thailand and imported to USA before the 2008 Burma embargo, and hence considered of Thai origin and pre-embargo stones. Finest Pigeon's blood red color, classic round shape, Burma ruby for Vedic astrology. This is the color that made famous for millennia rubies from Burma, nowadays called Myanmar, a South-Eastern Asian country. 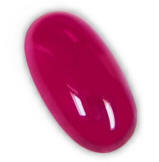 This is a Mom Hsu origin ruby, and has been traditionally gently heated, with no any other artificial treatments. Perfect shape, clarity is good too, with some typical veiling under magnification, but face up clean and with excellent luster. This pure, spectral red color, believe me, ladies & gents, is just rare in any ruby from any location. 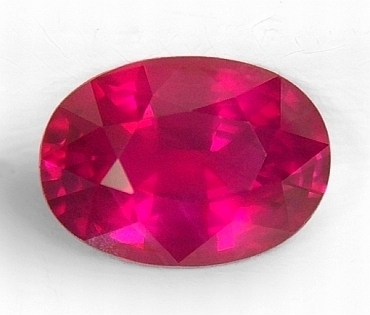 Very beautiful, super clean with excellent color, 3rd party certified unheated, Vedic ruby. This is a super crisp, 3rd party certified completely natural, with no heat treatment, ruby from the Niassa region of Mozambique, cut & polished in Bangkok. Beautiful vivid red color, the clarity is exceptional, basically loupe clean with a slightly elongated oval shape, and great luster, sure to make a most enticing jewel to propitiate the Sun. Very fine, auspicious Vedic ruby. Fine pigeon's blood red color, no pink tones, 3rd party certified unheated, Vedic ruby. This is possibly one of the reddest Vedic rubies ever offered by our company. This 3rd party, certified unheated ruby is hailing from the gem fields of the Niassa region in Mozambique, cut & polished in Bangkok. As rubies from all origins have an usual pinkish, purplish or orangish tones, this Mozambique ruby bears just a rare, pure red color, it is also super clean & guaranteed to attract the benevolence of the planet Sun in your life. 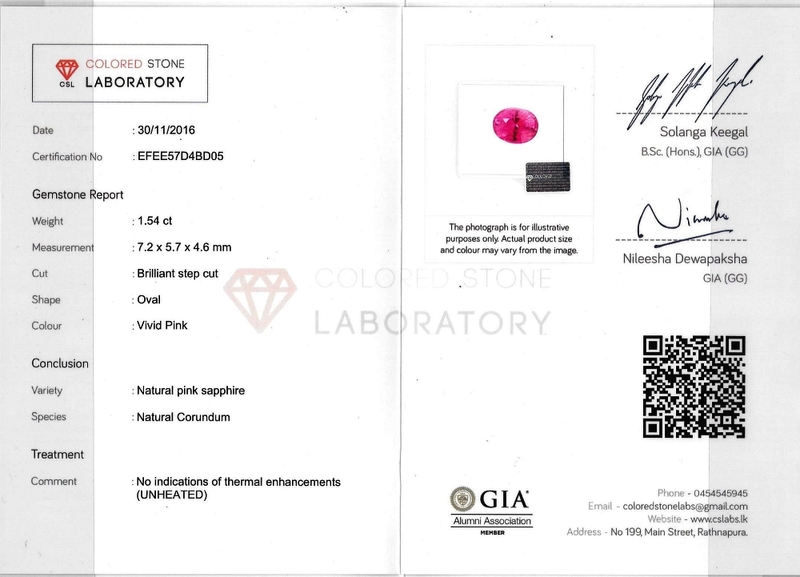 Certified unheated by the GIL (Gemological International Laboratories - Canada-Thailand). A most clean, definitely auspicious, 3rd party certified unheated, Vedic ruby. 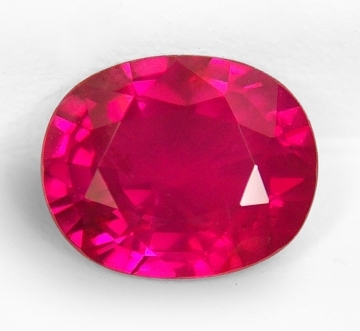 If you want a super flawless, 3rd party certified unheated, Vedic ruby, you should consider this one. 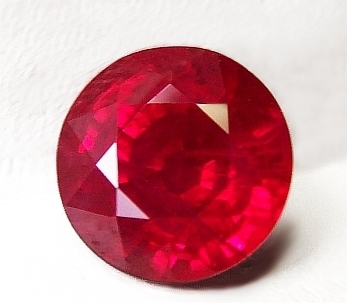 This clean clarity is very rare, especially in unheated material, which tends to be naturally included (ruby is a type 2 gemstone) and makes it a perfect candidate for a very auspicious, Jyotish quality ruby. The price is also great, because right now unheated rubies command huge prices. Will set very well in any setting. 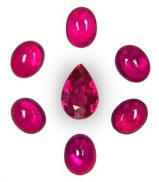 Sweet, perfect for a Jyotish Sun pendant, cabochon cut, Vedic rubies set. 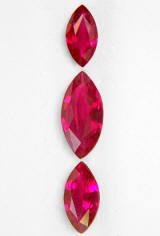 What about these, only low heated, ruby cabochons + a beautiful faceted pear shape as center set?. This is a beautiful set of natural rubies cabochon hailing from Mozambique, that have only been traditionally gently heated at low temperature with no added chemicals, hailing from the Niassa ruby deposits of Mozambique. pear shape might be no heat. Great transparency, color is the classic intense pinkish-red of the Mozambican material. We can create a beautiful Jyotish "Sun" pendant for it. Inquire. Very sweet, ideal for a Jyotish Sun pendant, cabochon cut, Jyotish rubies set. Very lovely. Our mission is to make Jyotish gemology affordable for all. These, only low heated, ruby cabochons represent a great value. 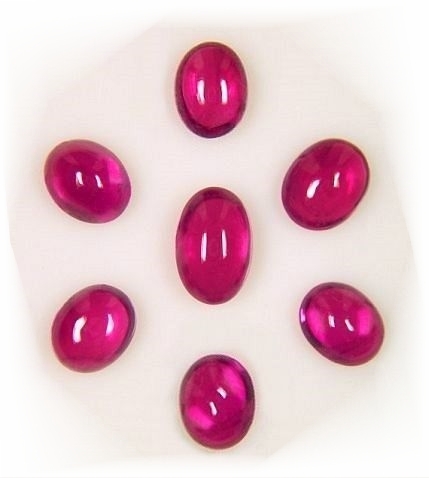 This is a beautiful set of 7 natural rubies cabochon hailing from Mozambique, that have only been traditionally gently heated at low temperature with no added chemicals, hailing from the Niassa ruby deposits of Mozambique. Ideal for an uplifting & beautiful to the eye, Sun talisman. Ask for our custom design. Alluring color, very well shaped and of good size, cabochon cut, natural ruby for Jyotish & Vedic astrology. 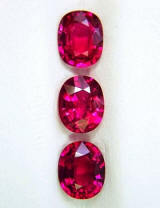 These, only low heated, ruby cabochons listed here represent a great value. 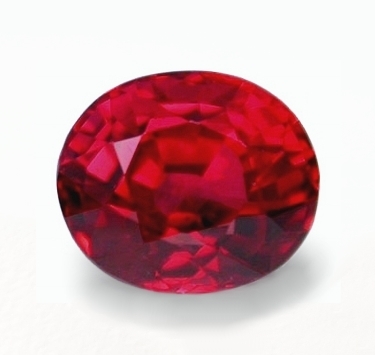 Here is a natural ruby that has only been traditionally gently heated at low temperature with no added chemicals, hailing from the Niassa ruby deposits of Mozambique. Great translucency, just silky, no cracks and very homogeneous & clean in its look, with a great and rich vivid pinkish-red color that glows in direct sunlight. Great price destined to set very well & exotic in one of our one-of-a-kind talismans. Ask for them. 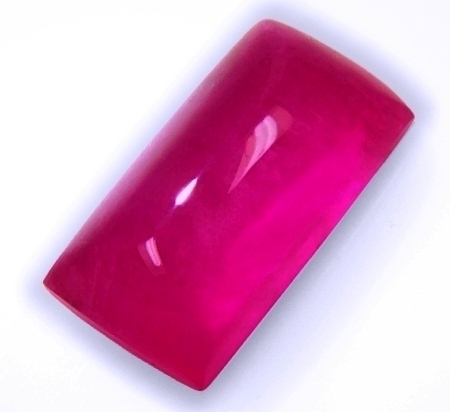 Seductive, well shaped and with good color, cabochon cut, natural ruby for Jyotish & Vedic astrology. 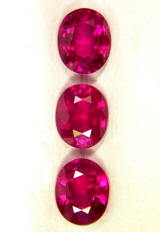 These, only low heated, ruby cabochons listed here represent a great value. This captivating natural ruby, only traditionally gently heated at low temperature with no added chemicals is hailing from the Niassa ruby deposits of Mozambique. Great translucency to transparent, with a stronger pink component is well done in shape, and sure to set perfectly in any setting. Auspicious too, and offered at a great price. Very lovely, great either ring or pendant, beautiful color, sugar loaf cabochon cut, natural ruby for Jyotish & Vedic astrology. Very lovely, 3-gems set, 3rd party certified unheated, astrological, Jyotish rubies. 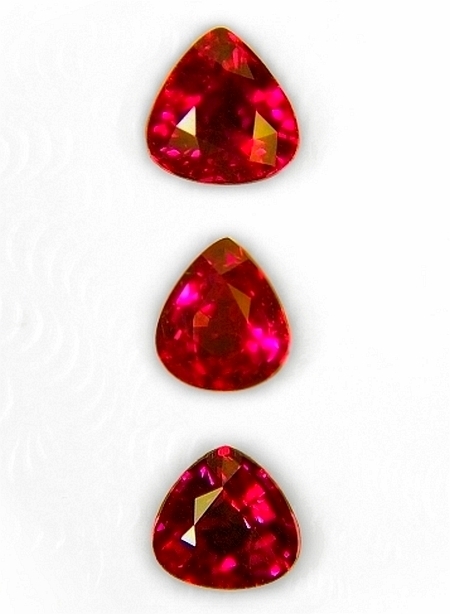 We picked up this trio of unheated rubies from Tanzania a while back. Gorgeous pigeon's blood red color. They are clean, well cut, lustrous and well matched, with a slight graduation of size. They are certified unheated as well. Great for an unique, astrological Sun pendant. We can design a bespoke jewel destined to love you. Just ask for it. 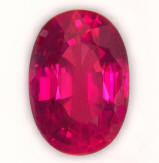 Captivating, beautiful color, no cracks or nicks, low heat, Mozambique ruby, sugar loaf cabochon. We have been lucky to obtain some ruby cabochons that are just silky, no major cracks or fractured. This one is a Mozambique ruby from the famous Niassa region, and it has only been traditionally heated, with no chemicals. Very beautiful to experience, great vivid color and a sugar loaf shape that is really well done. Guaranteed to set beautifully in any setting and harness the power of the Sun. Elegant, beautiful color, no cracks or nicks, low heat, Mozambique ruby oval cabochon. 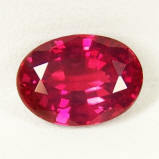 Very beautiful in color, this ruby has been only low heat treated. Great for Jyotish, it was mined in the Niassa, ruby region of Mozambique. Perfect translucency, no cracks or nicks, waiting for a beautiful ring to be created for it. Guaranteed to set beautifully in any gold metal, and attract the benevolence of the Sun. Superb "Padmaraga". 3rd party certified unheated, Ceylon, vivid, hot pink sapphire. Feminine, Jyotish ruby. 1.51 cts. - re-cut from original 1.54 cts. Drop of blood, velvety & spell-binding, 3rd party certified unheated, natural ruby. Beautiful. A beautiful, 3rd party certified unheated ruby, hailing from the Niassa region, Northern Mozambique. Unheated, clean and well cut rubies are right now extremely difficult to come by and command huge prices. By dealing directly with first hand mine owners, dealers and gem cutters, we bypass the several hands that bring up the price and We offer all of our rubies at basically wholesale. I love this one, so sensuous and velvety, clean and with great color. Imposing & utterly unique, 3rd party certified, low heat Tanzanian ruby. For a most gorgeous pendant. This lovely ruby is not intended for human consumption. Very beautiful in color (almost edible), with slender & charismatic shape, this Tanzanian ruby is just gorgeous. The energy emanating is strong & pure. The cut is perfect and has a a beautiful & homogeneous translucency. We can set it in a one-of-a-kind, Jyotish pendant for you. Set yourself apart. 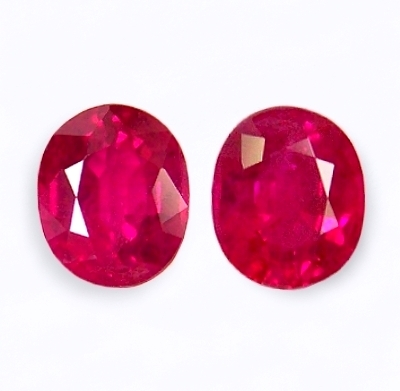 Alluring, very well matched, Burmese match ruby pair. Scarce to come by...great price. Great pair. One stone weighting 0.78 cts. and measuring 5.43x4.50x3.33mm, the other is a 0.71 cts., and measuring 5.47x4.50x3.14mm. Burmese rubies have always been steadily climbing in price. Very little production and huge demand worldwide keep prices always very high for what are considered the best rubies in the world. 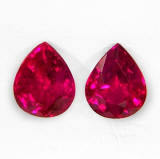 This is a great, very well match pair of clean and awesomely colored Burma rubies. Hard to find. 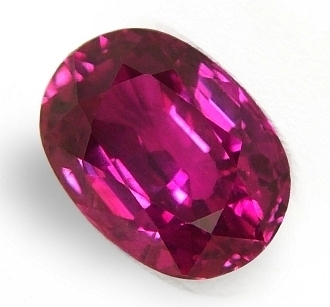 Auspiciously flawless, well shaped in a rare size, untreated, red-purple, Ceylon spinel. Ruby alternative. IF, Internally flawless, absolutely clean! 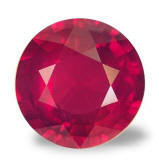 And if you like an auspicious & beautiful ruby alternative, this untreated, Ceylon spinel is a Sun uparatna not to be missed. It hails for the gem fields of Ratnapura, Sri Lanka. Exuding perfection and grace, this natural spinel is bless with a rare, loupe clean & flawless clarity. The cutting is also particularly well crafted. NGJA memo card from the National Gem & Jewellery Authority, Sri Lanka. 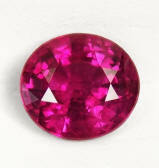 Very amiable, mystical, good size, 3rd party certified, low heat Tanzanian ruby. Ideal for either ring or pendant. A real nice ruby cabochon approaching 2 cts. that is only low heated. Hailing from the Winza area, Dodoma region, Tanzania. Beautiful in color, a mix of hot pink & red, that is just glowing. Excellent translucency, this is ideal if you are on a budget but still wanting a ruby to enhance the Sun energy in your life. Will mount very well in any setting you will choose. Gorgeously exotic, finest, "pigeon's blood" red, low heat, Burmese ruby. Unrepeatable deal. This is an old stock. A well priced and beautiful Burmese ruby hailing from the Mong Hsu tract, Upper Burma (known as Myanmar). Beautiful gem, a bit over a carat, & very well cut, with that awesome color that Burma ruby is famous for. It will set real nice in any setting. The price is well below wholesale for this quality. When this is gone, will not have another one of this quality... at this price. 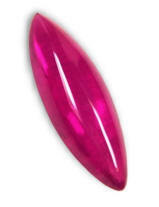 Magical shape, alluring gem, top pigeon's blood red, low heat, Burmese ruby. Burmese rubies are right now simply very scarce to come by. Blame it on the depletion of the mines, or the slow Western economy, or the huge demand from the China market, the fact remains that good stones are not readily available. So, do not miss this one. Hailing from the Mogok area, Upper Burma. A superb Burmese ruby in all respects, the shape is simply magical, and the stone is inundated with shimmer and firey eye appeal. Absolutely delightful, rare, Vietnamese ruby. Nice shape, clean clarity, definitely auspicious. A very beautiful, rare in shape & origin, Vietnamese ruby, this one hailing from the famous Luc Yen mine, Northern Vietnam. Heart shapes have a special charisma, a passionate allure that is definitely very captivating and feminine. Slightly over one carat, this gem displays a perfect cut that translate in exciting brilliance and overall a very feminine energy. Perfect ruby for Jyotish purposes without busting your bank. In truth under priced. "The rubies from these fragrant lands are found in a variety of hues....Some are like human blood,...some like the color of the rose at dawn. Being illuminated by rays of the Sun, this crystal species shines forth with wonderful color and brilliancy." Jyotish quality rubies are considered more powerful of other gems, therefore a 1 ct. ruby is enough for most people. Try to get at least 1 ct. stone. If your budget do not allow a 1 ct. stone, get the best you can afford. Unheated rubies are the most desirable for Jyotish purposes, but they are the most expensive. 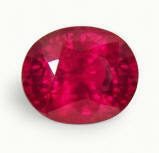 Burmese low heat treated rubies are also considered very good. 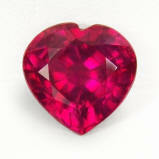 Simply put, heat treatment in rubies is considered comparable to the Sun's own nature. 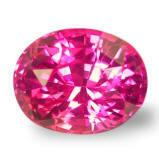 Pink sapphires are considered female stones. 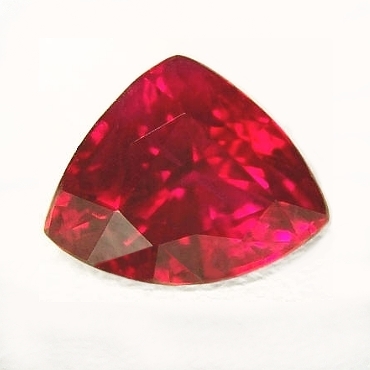 Surely beautiful, very lustrous, certified unheated, Mozambique ruby. Very low price on this one. A very brilliant & lively, 3rd party, certified unheated, natural ruby, this one hailing from the Niassa region, Northern Mozambique. Nice cushion shape, bright & scintillating, this is a no heat ruby that is guaranteed to please the eye, uplift your spirit and enhance the favors of the planet Sun. Perfect & ideal, Jyotish ruby offered at a great price. Most awesome pigeon's blood red color, very well match, Burmese ruby pair. Beautiful. With Burmese rubies prices going through the roof, this match pair of Burma drops is surely a bargain not to miss. They hail from the Mong Hsu mine, Upper Burma. We have gone through a huge parcel of approx. 350 stones ranging from 0.5 to 1.2 cts. 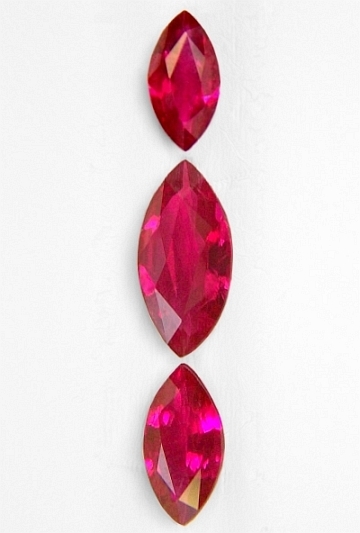 each, all drop shapes Burma rubies to make only two match pairs. This dealer used to get thousands of stones each year and these 350 stone parcel were what he bought in a year time. Definitely a must have. Will mount beautifully. 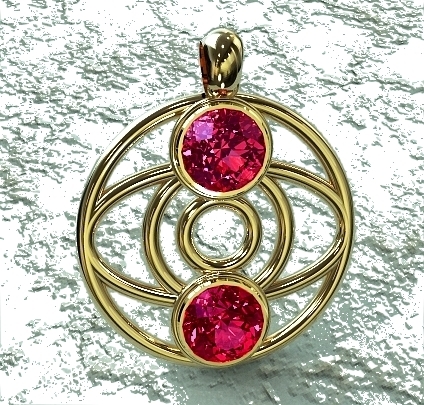 Definitely auspicious, magically beautiful, 14KY "sun talisman" with unheated, center ruby. Simply gorgeous. 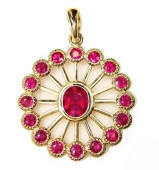 A most ravishing and beautiful, astrological, "Sun" talisman crafted in 14K yellow gold, mounting a center, unheated, natural Vietnamese ruby, weighting 0.79 cts., hailing from the Luc Yen mine, Vietnam. The outer, spoked frame terminates to a group of 16 round Burmese rubies, weighting 1.53 cttw., 2.5mm rounds, very bright and lustrous "neon", pinkish-red color, eye clean, VVS from the gem fields of Mong Hsu, Upper Burma. Simply gorgeous. 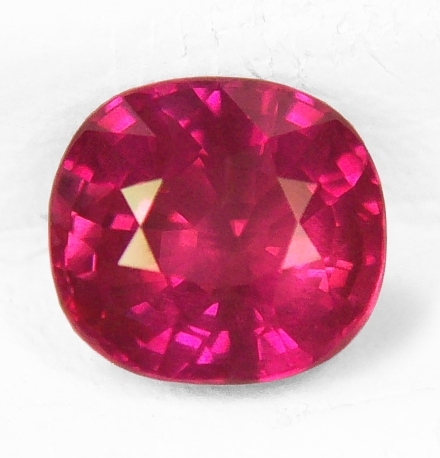 Hypnotic, very sensuous, highly auspicious, certified unheated, natural ruby. Very beautiful. 7.50 x 6.05 x 3.59mm. What a hot and sensuous color! 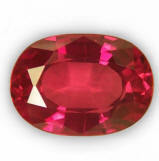 A most exotic, certified unheated, natural ruby, hailing from the Niassa region, Northern Mozambique. Unbelievably, in 2 years time, unheated rubies from Mozambique have gone up in price 200%. As no heat Burmese rubies are banned in USA, the only choice for American dealers is the unheated material from Mozambique. This one is a very fine sample of the beauty and glowing color they possess. 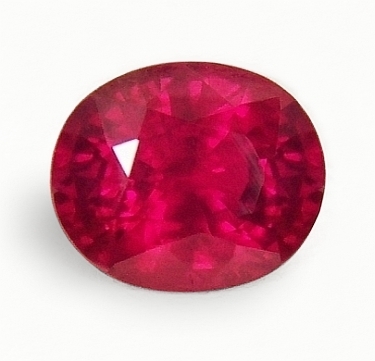 And it is certified by TGL (Tokyo Gem Laboratory) as an "unheated, natural ruby". Great, great price here. Dreamy, very captivating, certified unheated, natural ruby. Great size...great price. Imposing & conspicuous in size, definitely beautiful, this 3rd party certified unheated ruby hails from the Niassa region, Northern Mozambique. Great size unheated ruby with a mystical and spell-binding presence. Stone is super clean, with no inclusion, but a very light silk. And it is certified by TGL (Tokyo Gem Laboratory) as an "unheated, natural ruby" full certificate, accompanying the stone. Exceptional value at below wholesale. Do not get fooled by other gems companies and pay at inflated prices. 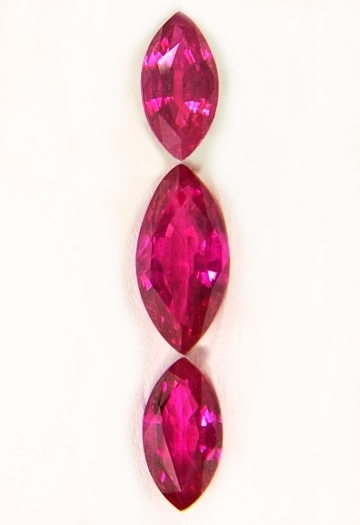 Excitingly lustrous, ideal pendant shapes, Burmese ruby, 3-gems set. Great quality, clean set. A very beautiful trio of Burmese rubies in pear shape cuts, all matching in color and size, hailing from the gem mines of Mong Hsu, Upper Burma. We guarantee an awesome presence when set in a custom, Jyotish pendant. Save a lot of $$$ versus a single stone of same carat weight, and that definitely will produce the same astrological & auspicious energy. Very beautiful, rare 2+ cts. total, fine Burma 3-gems pendant set. Perfect. 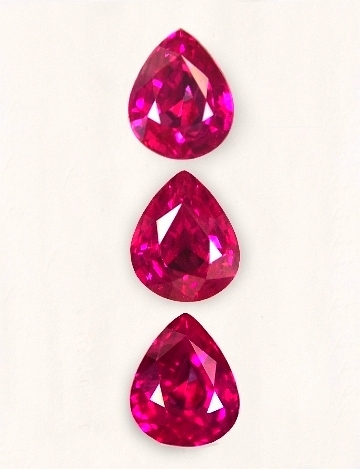 Top quality, Burma ruby, 3-gems set hailing from the gem fields of Mong Hsu, Upper Burma. Let us craft for you a gorgeous, 3-gems, Jyotish pendant. It will be unique, captivating, and guaranteed of the highest quality....and for the lowest price you will find anywhere. Rubies measuring 5.5x4.4mm, 5.6x4.5mm and 5.65x4.6mm, respectively from top to bottom, (v.v.slightly graduating in size). Imposingly sensuous, extremely clean, certified unheated, Winza ruby. A most perfect, rare and auspicious, unheated ruby. A gorgeously bright, 3rd party certified unheated, Tanzanian ruby hailing from the gem fields of Winza, Dodoma region, Tanzania. Needless to say, a very rare, astrologically auspicious and sought after unheated ruby, certified by one of the most prestigious and recognized gem lab in the world, GRS laboratory (Gem Research Swisslab). The $350 value, full certificate, accompanying the stone. Simply beautiful & unique, low heated, Burmese ruby, 3-gems set. You will love it. A very beautiful & exotic, Burmese ruby, 3-gems set hailing from the gem fields of Mong Hsu, Upper Burma. People ask why we like to make 3-gems sets. 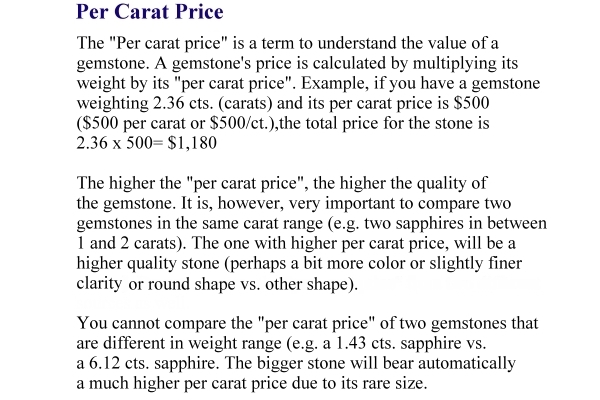 Well, the fundamental answer is that a 1.75 cts. single stone of comparable quality would fetch $7,000-$8,000. Quite a lot of savings in getting it in a 3-gems set. In addition, they make beautiful & charming pendants. Ravishing, uniquely beautiful, Burmese ruby, 3-gems set. Fine quality set. Absolutely ravishing, Burmese ruby 3-gems set, from the gem fields of Mong Hsu, Upper Burma. This is a great looking, clean & of fine color set with a good carat weight total, so it can be used well for astrological purposes. Have it set in a custom 3-gems pendant. They will mount simply fabulous! 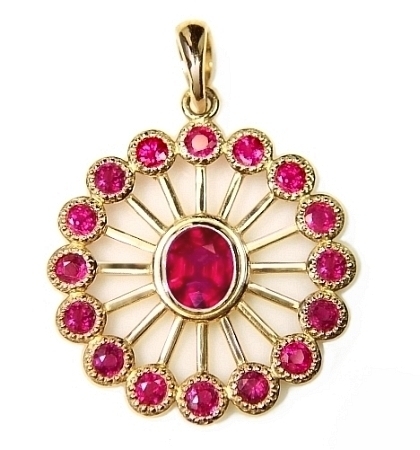 Simply delightful, very well matched, fine, Burmese ruby, 3-gems pendant set. All clean rubies. What a beautiful set of Burmese rubies. These were mine in the gem fields of Mong Hsu, upper Burma, and cut & polish in Chantaburi, Thailand. Lively trio, medium, vivid "pigeons' blood red color with a purplish undertone, all well cut and clean for truly an exotic eye appeal and a definite Sun energy. Have them set in an unique astrological ring or pendant, this will enhance your life and bright your day. Absolutely lovely, very unique combo, fine, Burma 3-gems pendant set. All clean rubies. This Burma ruby set hails from the gem fields of Mong Hsu, Upper Burma. We have been matching these 3 gemmy Burmese rubies for superior clarity (2 of them are loupe clean and one is a VVS1), top pigeon's blood color and a ravishing, high quality look. 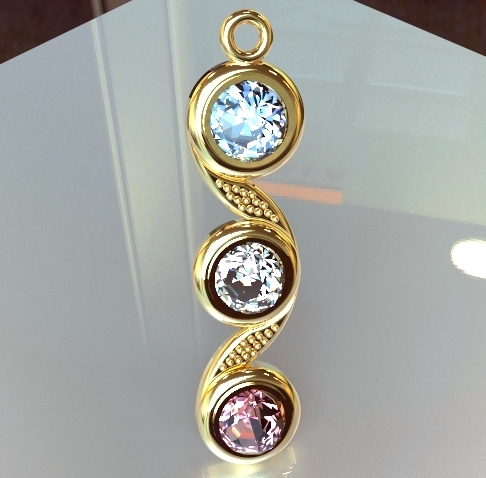 Have it set in one of our unique 3-gems designer pendant...you will love it & cherish it forever. 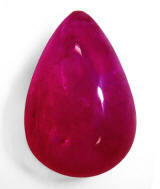 Very lovely, exotic ruby, great size, low heat Burma ruby cabochon. Great buy. I love this one. 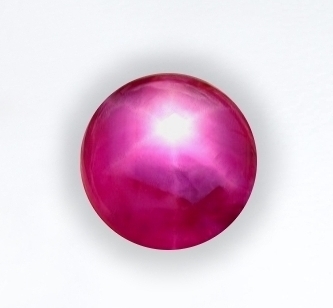 Burmese ruby cabochon, weighting 3.10 cts., medium, intensely saturated, red-pink color, well executed off-round cabochon cut, measuring 7.85x7.63x4.6mm, with very weak star, from the gem fields of Mong Hsu, upper Burma. This one was heated at low temperature (probably to make it a bit brighter), and somehow the star became weak. However, the size and round shape makes up for the missing characteristics. Very difficult to get this round shape in this carat size. Especially, cabochons set very well if you like an "antique feel", granulated setting design. Gorgeously brilliant, well shaped, unheated Vietnamese ruby. Very rare from this location...well below wholesale. This one has a fantastic, superb brilliance and incredible eye appeal! 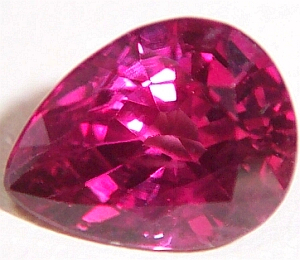 An unheated, luscious ruby weighting 1.18 ct., medium, "neon" pinkish, magenta-red color, excellent oval, mixed cut, measures 6.5x5.8x3.9mm, eye clean, VS type 2 from the Luc Yen mine, northern Vietnam. Rubies from this location resemble Burmese pinkish stones, but at considerably lower prices. 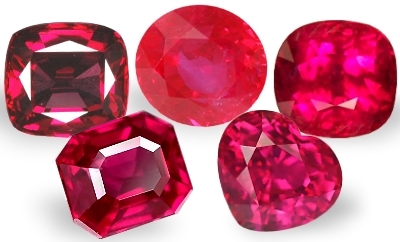 During the ancient Vedic civilization, medium pink-red hues rubies were considered Padmaraga or feminine rubies. While deep, blood red rubies were considered masculine stones. Gorgeous brilliance, awesome astrological energy, unheated....extremely rare...well below dealer price! Very rare, most auspicious for Jyotish, unheated, Mozambique ruby. Very well priced...flawless gem. A very clean and spiritually auspicious, unheated Mozambique ruby, weighting 1.23 cts., medium-dark, reddish-purplish in color, well executed, oval, mixed cut, measuring 7.25x5.31x3.59mm, flawless gem, IF-VVS type2 from the Niassa region,. Northern Mozambique. Approx.18-19 months ago, in the northern part of Mozambique, at the borders with Tanzania, a new discovery of ruby deposits was unearthed. The color ranges from pure pink to pigeon's blood red, and anything in between, often bearing an orange undertone. Of course, unheated, clean, flawless material is always very, very scarce. All in all, these unheated Mozambique rubies are a great value opposed to unavailable unheated rubies from Burma. Delightful, "pigeon's blood" color, Burmese ruby. Beautiful, feminine "Padmaraga" ruby. A spell-binding & luscious, Burmese ruby, weighting 1.14 ct., medium, intense, pigeon's blood red, with pinkish tones, (and strong saturation of color), perfectly executed, oval, mixed cut, measuring 6.32x5.52x4mm, eye flawless, VVS type2 from the Mong Hsu area, Upper Burma. This stone has been low heat treated only (to very low temperature) to just dissolve the rutile silk present. A gorgeous, superbly cut ruby that is a delight to experience. Exceptionally well priced for this Burma quality as prices are constantly raising due to a huge demand and very little availability. The "Twin Suns", astrological sign talisman with unheated Winza rubies! Mystically auspicious. 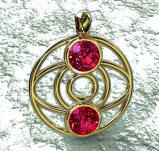 A truly magical & spell-binding, Sun astrological, sign talisman, mounting a gorgeous match pair of unheated, Winza rubies, avg. weight 1.4-1.5 cts. total for the rubies, top, finest pigeon's blood red color, measuring 5mm round, mixed cut, eye flawless, VVS to VS type2 from the Winza mines, Dodoma region, Tanzania. The compelling design is very mystical and definitely an one-of-a-kind, so beautiful and amazing to experience. And the unheated Winza, pigeon's blood red rubies are fantastic and in truth hard to get. Specify in your order form in which carat gold you like it. We have only very few of these Sun jewels,...and they are truly gorgeous! 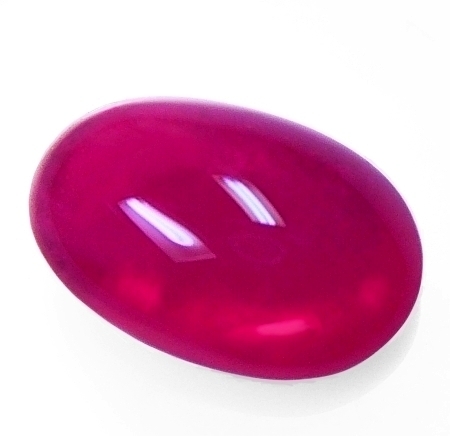 Magical, clean clarity, top brilliance, low heat, Burmese ruby round. Very scarce material...great gem. Another gorgeous and well cut, Burmese ruby weighting 1.0 cts., top, finest, pigeon's blood red color, excellent, round, mixed cut, measuring 5.8mm in diameter by 3.7mm deep, eye clean, VS type2 from the gem fields of Mong Hsu, Upper Burma. Buyer beware that so many people are selling African and Madagascar rubies for Burmese stones. Only Burma rubies will fluoresce under ultraviolet light, the rest will stay inert. I get amazed by some sellers, especially on Ebay, selling 5-6-7-8 cts. rubies as Burmese stones. Burma rubies over 2cts. are extremely rare, and outrageously priced, and sporadically available. Great Burma ruby this one, great price! Adorable heart shape, fine scintillation and mesmerizing color, "padmaraga" ruby. Very beautiful ruby this one. It weights 1.25 cts., fine, pigeon's blood red color, slightly purplish, perfectly executed, heart, mixed cut, measuring 6.22x6.35x3.97mm, eye flawless, VS type2 from the gem fields of Northern Madagascar. This stone is simply adorable, possessing a delightful eye appeal. The shape is well done, top clarity and that rich, pigeon's blood color with pink tones (consider a "Padmaraga" or feminine ruby) that shimmer in any light environments. Do not delay on this beauty...any setting you will choose, will mount supreme. Highly heated. Museum quality, extremely rare, never seen a ruby like this, huge & clean, Madagascan ruby. For a king or queen. 21.96 cts.! Yes, that's right. This museum size ruby weights a record 21.96 cts., deep, pigeon's blood red color with strong saturation, perfectly executed, "antique" cushion, mixed cut, measuring 16.4x14.24x9.42mm, eye clean, VS to top SI clarity, type2 from Madagascar. Our cutter in Chantaburi called us saying that he had recently cut two exceptional stones (shown here together with the one on the left). We called, he faxed back the details, and that was it. After a week we were in possession of these royal gems! Really superb, museum rubies at a ridiculous, give away price. 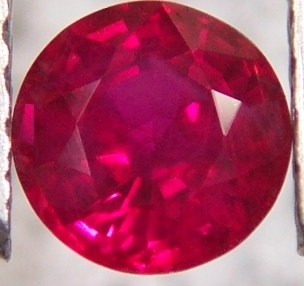 This is a natural ruby, heated and clarity enhanced. Clean & well cut, sweet, low heat, 1+ cts. Thai ruby. Very affordable. A very lovely Thai ruby for the person on a budget. This sweet ruby weights 1.09 ct., medium dark, purplish-reddish color with pink tones, excellent, oval, mixed cut, measuring 6.93x4.95x3.45mm, eye clean, VS type2 from the Chantaburi area, Thai-Cambodia border. 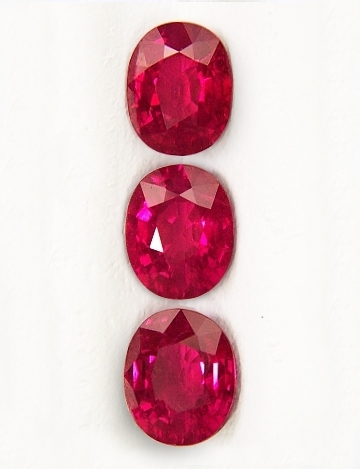 Thai rubies are sporadically mined nowadays, and always in small sizes. This clean and sweet 1+ ct. gem is very well priced, and guaranteed well below wholesale. Where else can you find a clean, well cut ruby at this price? Finest pigeon's blood red, 2+ cts. size, superbly cut Madagascar ruby. The finest red ever. One of the finest pigeon's blood red color in a 2+ cts. size ruby ever offered. It is simply magnificent! The poor picture does not reveal it at all. Many would sell this particularly intensely saturated red hue as Burmese, but we are not those "many". This passionate and spell-binding ruby weights 2.68 cts., finest, top of the scale, "pigeon's blood red color, perfectly executed, oval, mixed cut, measuring 7.84x7x5.75mm, eye clean, VS type2 from Madagascar. Yes, once in a while we get our hand on something that we are proud of. See it for believing it. An exceptional ruby at a gift price. 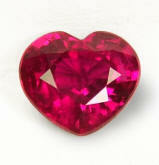 Fabulous, exceptionally rare, unheated, lovely heart shape, Vietnamese ruby. One-of-a-kind gorgeous! A truly rare and magnificent gem. 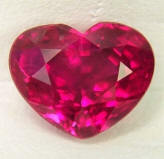 1.51 ct., medium-dark, electric, magenta-red color, excellent heart shape, measuring 5.7x7.2mm, eye clean, VS type 2 from the Luc Yen mine, Vietnam. Cannot spend so many words on this stone, it has it all! 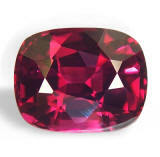 Completely transparent rubies of over 1.5 ct., in their unheated state, are very rare and costly! Destined to become a fantastic center piece, a true heirloom quality stone or a wonderful addition to any collection, it is priced at our cost and it better than a steal! When we will certify the stone, will raise the price! Alluring, top, hot purplish- pink, unheated, Ceylon sapphire. Gorgeous shape...top gem, hard-to-get! A top hot, hot, Ceylon pink sapphire, approaching a ruby color. A mesmerizing Ceylon sapphire with an amazing beautiful cushion shape. It weights 2.20 ct., top hot, hot pink color, with slightly purplish undertones, masterly executed, cushion with rounded corners, mixed cut, measuring 9x6.2x4.18mm, eye flawless, VVS to VS type2 from Sri Lanka. A very scarce supply of red-pink sapphires, in the past year, has caused to skyrocket prices and limit availability. Pink sapphires have reached exorbitant prices. Here is your chance to get an amazing pink, perfectly cut, & clean at a great price. Captivating, very lovely, rare low heat, Vietnamese ruby. Great gem...under priced. Gorgeous, Vietnamese ruby, weighting 1.19 ct., medium-dark purplish-red with orangish overtones, well executed, drop, mixed cut shape (pear shape), measuring 7.03x5.45x3.9mm, eye flawless crystal, VVS2 type 2 from the Luc Yen Mine, Vietnam. The clarity is exceptional for a ruby and so the good size, typical, Vietnamese color and cutting. The Vietnamese material is cleaner than the Burmese, and also more difficult to come by. Old stock at a super price! We took this stone with us in Bangkok and have it checked by Emil Gem Lab stating it as "low temperature" heat ruby. Very rare! Alluringly lovely, good color, low heat, Thai, "padmaraga" ruby. Old stock...giveaway price. Another, basically 1 ct., Thai ruby at a super low price for this transparent quality. 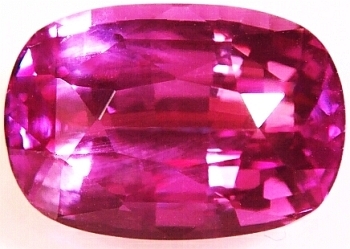 This one weights 0.97 ct, medium-dark, purplish red with strong saturation of color, excellent pear cut, measuring 7x5.3x3.5mm, eye clean from the Chantaburi area, Thailand. 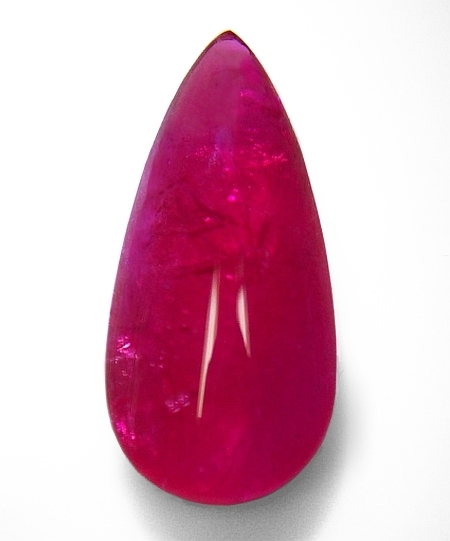 Again, a rare, transparent Thai ruby that is approaching 1 ct. in size. The price is very low, and these are not to be confused with semi-transparent or opaque qualities. Nice stone here, sold at cost.